All food and goods disappeared from the shops - confiscated by the Soviets. You had to queue for hours for essential foods. There was no longer private property. Priests were arrested and jailed or deported. Luck Cathedral became the Museum of Atheism. He and other Home Army members observed the movements of railway trains. In July 1940 Josef Tarnowski was arrested by the Soviet Secret Police (NKVD). He was told that they wanted names and weapons. He was interrogated for four days and nights. They wanted him to sign a confession that he was a counter-revolutionary. Josef signed the confession and was taken to a nearby convent which had been converted into a prison. Five months later on Christmas Eve 1940 he was put on trial. The prosecutor called for the death sentence but under Soviet law someone under 18 when the crimes were committed could not be shot. He was sentenced instead to 10 years in the Gulag. The journey to the labour camp at Vorkuta in Siberia took one month. The trip was made by train in cattle trucks. Jozef made stops on the way in various prisons at Lwow, Kiev, Dniepropietrowsk and Kharkow before travelling onwards into Siberia. Eventually he arrived at the camp in the frozen tundra. The task of the camp inmates was the construction of a rail link. In the camp people died every day. Jozef began to develop open sores on his legs - scurvy was setting in. He knew if things continued as they were that his time left was limited. In June 1941 Nazi Germany attacked the Soviet Union. The following month the Soviets signed an agreement with General Sikorski in London. This agreement led to the release from captivity of members of the Polish Armed Forces in the Soviet Union. Jozef and his fellow Poles were released from the camp and given an official document explaining who they were. They travelled by train, in cattle trucks, but this time without NKVD guards. They eventually arrived at Buzuluk where the Polish Army was being formed but there was so many people waiting to be processed that they were sent on to Uzbek villages. Later in the autumn of 1942 Jozef took part in the evacuation of the Polish Armed Forces from the Soviet Union to Persia. In Persia he was taken to a hospital in Teheran for treatment for malaria. He was then sent to Iraq to take part in Officer Training. After completion of his training he applied to join the Polish Parachute Brigade. The Parachute training was to take place in Great Britain. Jozef made his way from Iraq, through Syria to Palestine and then across the Sinai desert to the port of Suez. There he boarded the ship Isle de France for the long sea journey to Britain. The ship sailed south through the Indian Ocean to the South African port of Durban. After two weeks in South Africa the ship travelled into the Atlantic and eventually arrived in Gourock, Scotland. Jozef then reported to the 3rd Battalion Parachute Brigade based in Fife. 1st day - the British and American parachute regiments would go in. 2nd day - the heavy weapons would be dropped. 3rd day - the Poles would go in. The objective for Jozef's Polish company of Paratroopers was to capture a military radio installation south of the River Rhine. The pre-drop briefing had assured them of only light resistance. The Polish paratroopers were delayed in taking off for two days because of fog. On the third day the 1,700 paratroopers departed in 114 planes. Only about 1,000 soldiers dropped as the rest of the planes turned back due to fog. In 2006 the government of the Netherlands awarded the Polish Brigade the highest military decoration and British veterans of the 1st Airborne division commemorated General Sosabowski, commander of the Polish parachute brigade, with a monument in the Dutch town of Driel. 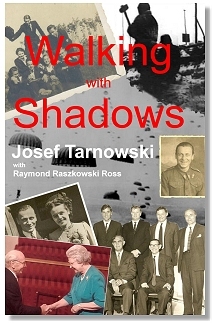 At the end of the war Josef Tarnowski decided to remain in Britain rather than return to Soviet dominated Poland. He married a Scottish woman in August 1947 in Fife and then spent most of his working life as an engineer in England. They retired to St Andrews, Scotland, in 1983. Josef Tarnowski died in 2010 aged 88. Publisher - Published in 2009 by Glen Murray Publishing, Scotland. This page was added on 12 March 2011.